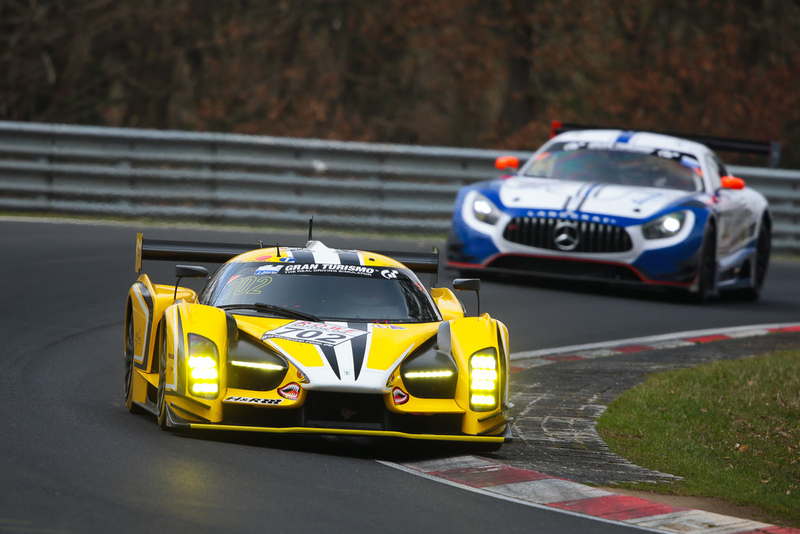 Scuderia Cameron Glickenhaus (SCG) has won its class at the first round of the famous VLN championship at the Nurburgring Nordschleife. With a record-breaking 194 entrants (including almost 40 GT3 cars) this was the most competitive VLN round in the history of the series. Starting from 20th after qualifying, the sole SCG entry also finished 11th overall at the four-hour race on Saturday, having mixed it with the world’s leading sports car manufacturers from start to finish. At the wheel of the bright yellow car 702 (the second example of the SCG003C to be built) were Thomas Mutsch, Jeff Westphal, Andreas Simonsen, and Franck Mailleux. Taking turns at the wheel in warm and dry conditions, they each managed to complete about an hour of driving in competitive conditions at the world’s most demanding race track. The SCG003C proved to be entirely reliable from start to finish, with only a large number of yellow flags – denoting various on-track incidents – preventing the car from making further progress. The day before the VLN1 race, SCG also took part in a test with another car at the Nurburgring, which was driven by noted racer Andrea Piccini for the first time, along with regular SCG driver Felipe Laser. Yet more valuable data was collected in preparation for SCG’s next race, the four-hour VLN2, which the team will contest with two cars on April 8 as part of the build-up to the Nurburgring 24 Hours at the end of May. Having once again proved its sporting credentials against the best-known car manufacturers in the world, SCG is aiming for another strong result next time out.